Posted March 18th, 2019 by Willie Costello . We are happy to announce that next fall, CPAMP alum Marion Durand (PhD 2018) will be joining The Faculty of Philosophy at the University of Oxford as Associate Professor and Tutorial Fellow at Corpus Christi College, and Associate Lecturer at St John’s College. Posted March 6th, 2019 by Willie Costello . We are happy to announce that next fall, CPAMP alum Jacob Stump (PhD 2017) will be joining the Philosophy Department at Northeastern University (Boston, MA) as Assistant Teaching Professor. Congratulations, Jacob! Posted November 12th, 2018 by Willie Costello . Posted September 13th, 2018 by Willie Costello . All sessions are free and open to the public and will be held in Room 100 of the Jackman Humanities Building. Organized by Martin Pickavé, Deborah Black, and Peter King. Posted September 6th, 2018 by Willie Costello . Posted August 6th, 2018 by Mark Gatten . Posted April 6th, 2018 by Mark Gatten . Congratulations to recent CPAMP graduate, Bryan Reece, who will begin a one year fellowship at the Center for Hellenic Studies in Washington D.C. this fall. During his fellowship, he will be working on a monograph called Aristotle on Happiness, Virtue, and Wisdom. Be sure also to keep an eye out for his many forthcoming publications: ‘Are There Really Two Kinds of Happiness in Aristotle’s Ethics?’, forthcoming in Classical Philology, ‘Aristotle’s Four Causes of Action’, forthcoming in Australasian Journal of Philosophy, and ‘Out of Thin Air? Diogenes of Apollonia on Causal Explanation’, to be published in an edited volume entitled Heat, Pneuma, and Soul in Ancient Philosophy and Science: From the Presocratics to Aristotle, by Cambridge University Press. Posted March 30th, 2018 by Willie Costello . Participation in the conference is free, but preregistration is required: contact Rachel Barney at rachel.barney@utoronto.ca or Roberto Granieri roberto.granieri@mail.utoronto.ca. Posted March 26th, 2018 by Mark Gatten . This is the tenth Annual Toronto Workshop in Ancient Philosophy (ATWAP). The theme for this year’s workshop is ‘New Approaches to the Presocratics’. All sessions will be held in Room 100, Jackman Humanities Building, 170 St. George St. Toronto. For more details, see the ATWAP page or the Events page. Posted January 19th, 2018 by Mark Gatten . 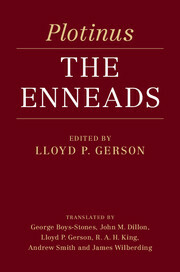 Professor Gerson, working with a team of scholars, served as editor and contributing translator for the first complete edition of the Enneads in English in over 75 years. The other translators were George Boys-Stones (University of Durham), John Dillon (Trinity College Dublin), R. A. H. King (Universität Bern, Switzerland), Andrew Smith (University College Dublin), and James Wilberding (Ruhr-Universität, Bochum, Germany). The new edition was based on the best available text, the editio minor of Henry and Schwyzer and its corrections. The volume was published by Cambridge University Press in December, 2017.